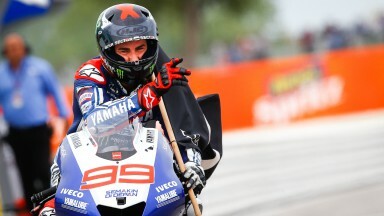 Jorge Lorenzo thanked his team for making changes to his bike on Sunday, which he believes were crucial to his GP Aperol di San Marino e Riviera di Rimini victory. Taking full advantage of the introduction this weekend of the new Yamaha seamless transmission, Lorenzo produced a ruthless performance to take a one-second lead on the first lap and did not look back from there. The win was Lorenzo’s second in a row, after his triumph a fortnight ago at Silverstone - and was remarkably the World Champion’s sixth successive victory in Italy, when race wins from both Misano and Mugello are included in his haul. The 25 points gained on the Adriatic Coast now put him level in the standings with old rival Dani Pedrosa, although Lorenzo has second in the classification courtesy of more 2013 race wins. However, with Marc Marquez finishing second, Lorenzo still trails the rookie sensation by 34 points overall, with five races left. Stepping off the Misano podium Lorenzo stated, "It is important to win, because we don’t lose points but we have only recovered five points, so it is the same as Silverstone. It doesn’t make a big difference to the championship. But I’m very happy for this victory, because we struggled a lot during the weekend especially on braking." 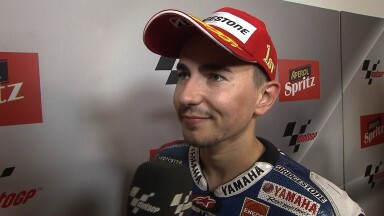 Having looked strong from the first moment of Warm Up on Sunday morning Lorenzo explained that his team had made a crucial suspension adjustment to improve braking performance. He noted, "We made some changes to the bike in morning session and it really made a big difference." "So I decided to go with the same strategy as the last four or five races and I was able to do it this time, to go away in the lead from the beginning. It was a very hard race physically because Dani and Marc never gave up, their pace was very constant. Really I want to say a big thanks to my team as they improved the bike a lot for this race."